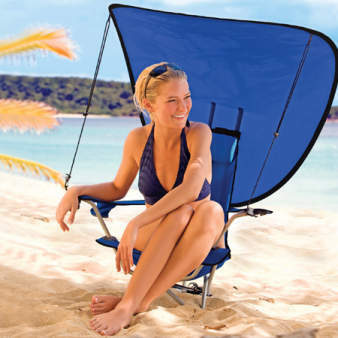 Excellent small outdoor chairs with sun canopy – Do your dream! We had some lovely and comfortable chairs we took away with us, but they were too big and space is precious in a van. We were also on the look out for a sun umbrella so we can sit on the beach without frying. So we decided on 2 reclining ones to spoil ourselves! The chairs conveniently convert into a back-pack for easy carrying. Really well engineered. Ultraviolet sun canopy blocks up to 94% of harmful rays from the sun. The reclining function took a while to master, and getting the canopy away is interesting, but the chairs are comfortable and the cup holer will be perfect! They are a little low so if you have back problems then they may not be for you, but as a compromise for size & functionality they are great. The canopy can be fitted if/when you need it, and can be adjusted in angle with ease to block out the sun and even provide full shade. Just need to get them packed now and ready for the beach!